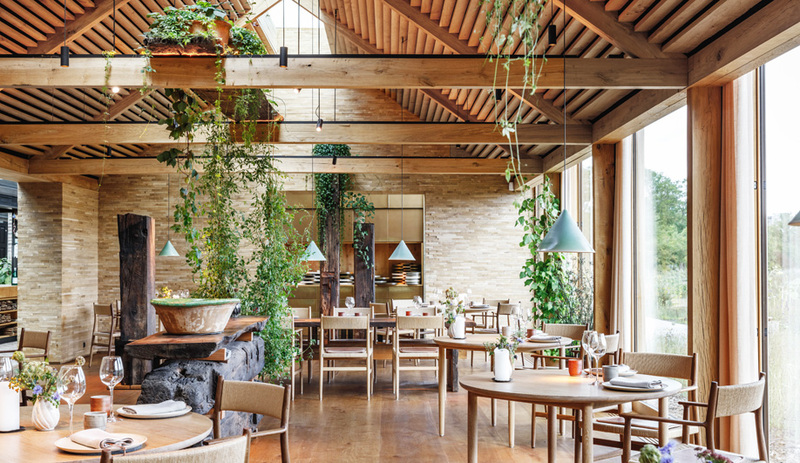 From Yabu Pushelberg’s swanky London Edition hotel to Olson Kundig’s conversion of an auto garage into a tasting room, we round up this year’s 10 standout interiors. 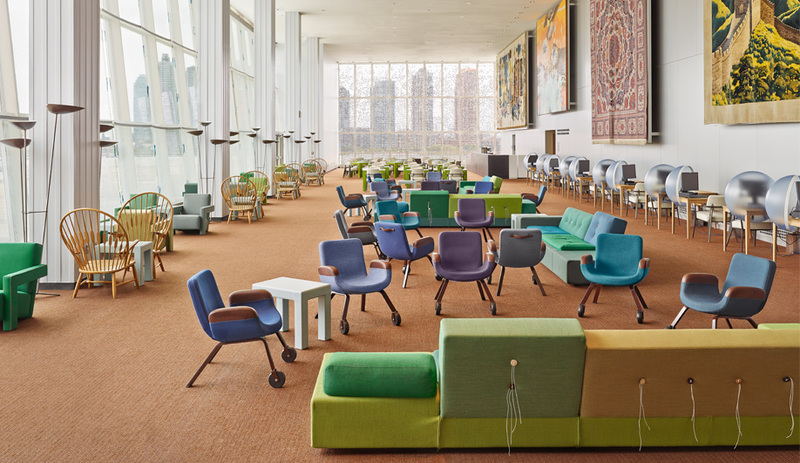 Sixty years after its opening, the North Delegates lounge at the UN building in New York was re-vamped (as a gift from The Netherlands) by Dutch designer Hella Jongerius, with the help of Rem Koolhaas, Irma Boom, Gabriel Lester and Louise Schouwenberg. The team opened up the space (originally designed by Le Corbusier, Oscar Niemeyer and Wallace K. Harrison), by removing the mezzanine, which blocked the view of the East River, and repositioning some of the existing iconic Scandinavian artwork. 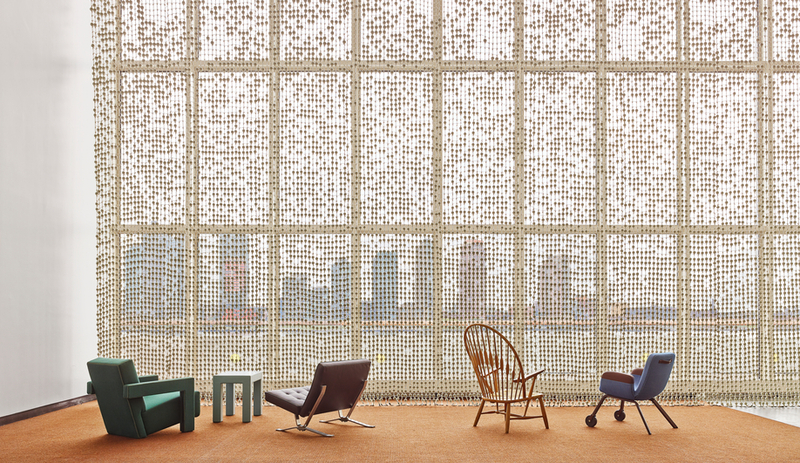 Jongerius devised a muted colour palette and created two new pieces for the lounge – her Sphere Table (manufactured by Vitra) and UN Lounge Chair – as well as the hand-knotted curtain made of 30,000 porcelain beads, which she produced with Royal Tichelaar Makkum. If we can 3D-print burgers and guns, why not a room? Made from 11 tonnes of printed sandstone, this 16-square-metre, Gaudi-esque structure is courtesy of Zurich’s Michael Hansmeyer and Benjamin Dillenburger. Over the course of a year, the duo developed and refined customized algorithms until they produced a complex geometry of 260 million individual facets with 78 gigs of data. 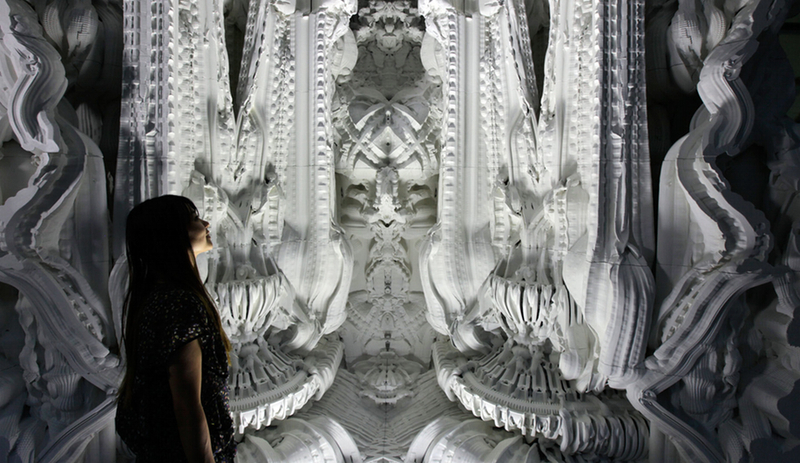 Taking a month to print on a Voxeljet AG system and a day to assemble, Digital Grotesque is now part of Jakob + Macfarlane’s FRAC Centre’s permanent collection, in Orléans, France. 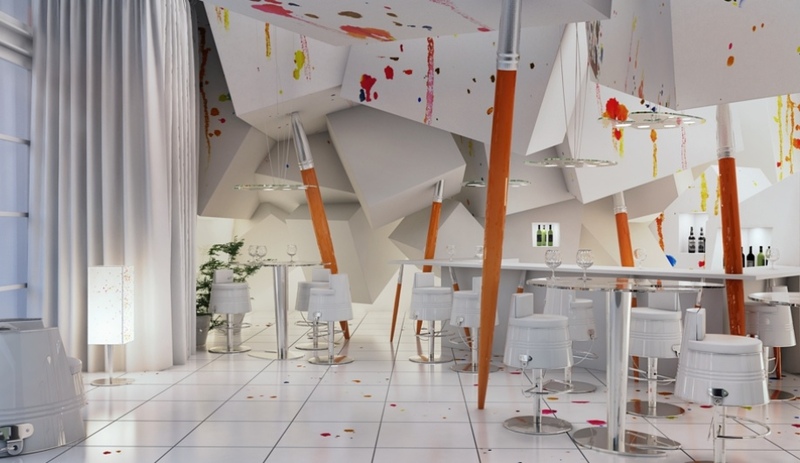 Slaughterhouses and sewing rooms inspire Poland’s Karina Wiciak, who cleverly devised themed bar and restaurant interior concepts for each month of 2013. Pracownia (shown), which means workshop in Polish, is a white canvas-like space with colourful splashy details. 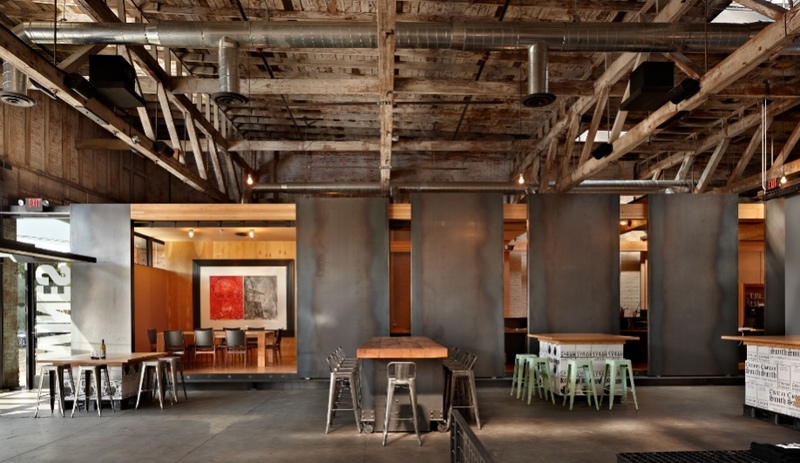 Oversized paintbrushes act as structural columns and palettes become pendant lights and glass table tops. Giant, over-turned paint buckets make up much of the furniture, including the toilet bowl and sink in the bathroom (with the mirror and countertop mounted on an easel). The painter’s studio-inspired space is number 10 of Collection XII. Following their design for the Google Campus in London’s Shoreditch, Jump Studios was invited back to create a home for the internet giant’s Madrid headquarters. 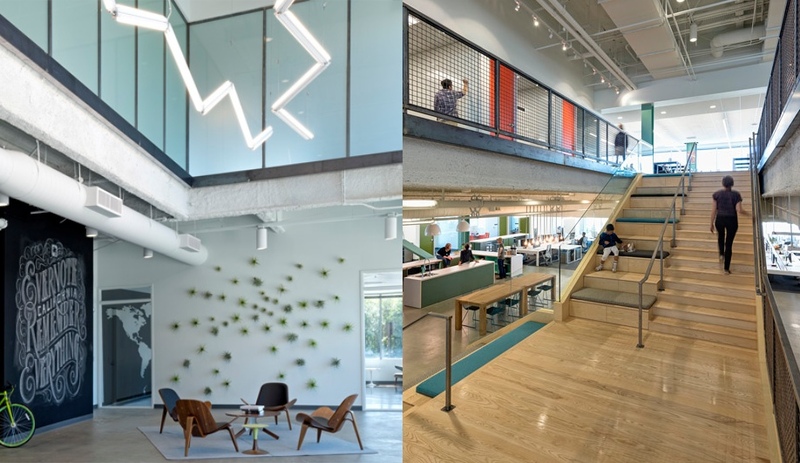 The twelve-year-old U.K. firm, whose roster of clients include Red Bull and Nike, used birch and cork to anchor the on-brand colour injections through the furniture and wall graphics. 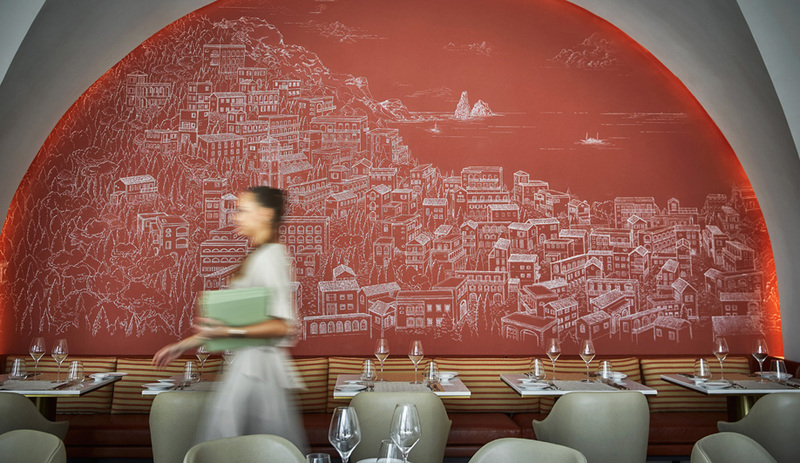 To reflect the location, traditional Spanish-style arches abound, dramatic breakout areas are painted in fiery shades, and words such as ‘Barcelona’ and ‘Granada’ adorn meeting room walls. 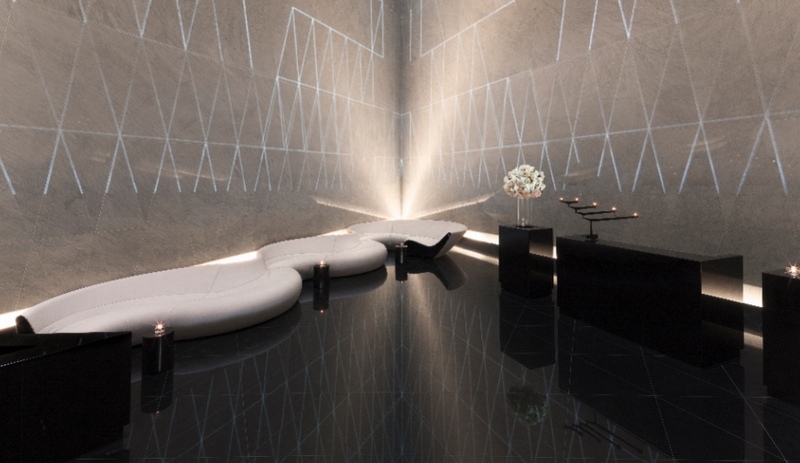 A nine-storey-high pyramid, clad entirely in white finishes – including ample marble –contrasted by the black polished granite floor, makes for one of the world’s most exquisite venues to indulge in bubbly. 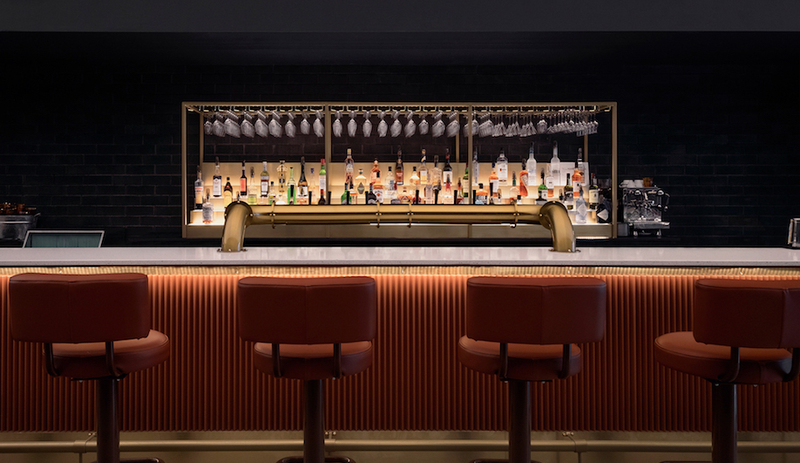 Norman Foster’s interior at the ME Hotel on The Strand in London features a 30-metre-long curving bench, sleek black reception desks and a freestanding triangular champagne bar, complete with illuminated images of jellyfish on the walls. 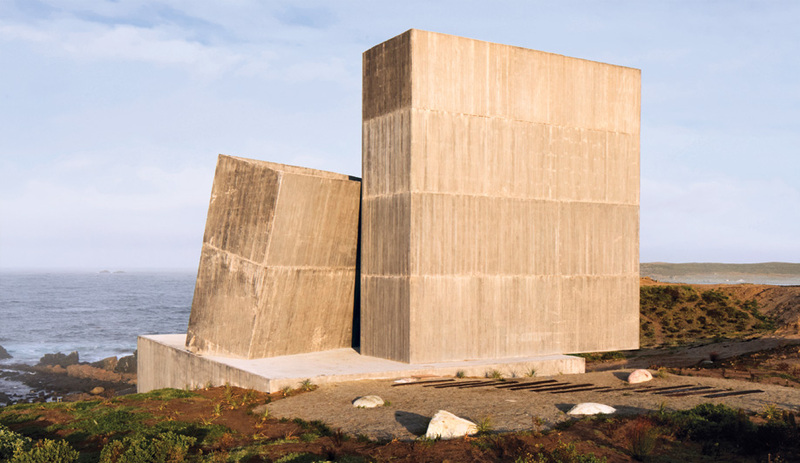 A small opening at the top of the geometric structure lights the space. 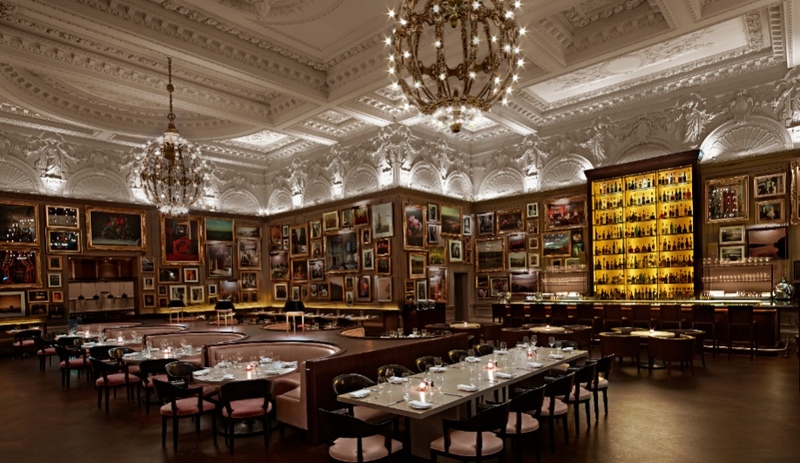 The interior nabbed the top prize at this year’s Restaurant & Bar Design Awards. Never one to shy from provocation, the Brit designer devised a bloody good installation for Hermès’s Petit H, an arm which uses the brand’s offcuts and rejected stock to make new product. In the brand’s London shop, the exhibit (on until tomorrow) showcases garments hanging from wood replicating the tools and workbenches of the Petit H atelier. Dripping pigmented resin creates the effect of blood oozing from the display units. 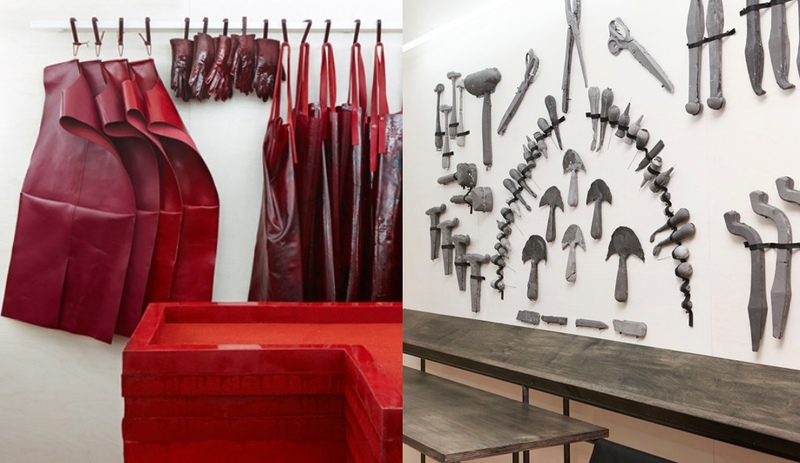 Visiting Hermès’s atelier proved to be inspirational in helping the designer “find beauty in the unexpected” – a talent Toogood continues to excel at. Brazil’s Marcio Kogan has a knack for designing stunning homes, in São Paulo and beyond. 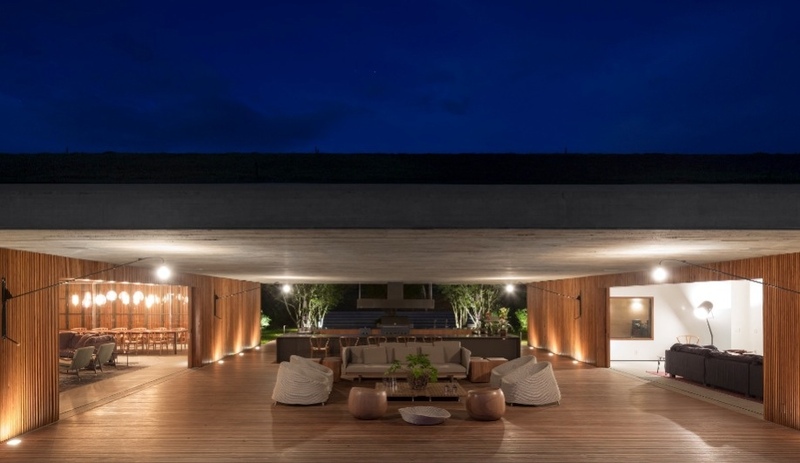 His most recent, a 715-square-metre residence on a hilly Brazilian landscape, creates an inviting environment that offers relief from the sweltering heat. Inside, MM House mixes old and modern beautifully: Jean Prouvé’s two-metre long pivoting Potence lamps for Vitra adorn the walls, while the living room is filled with such pieces as the Nebula Nine sofa by Diesel for Moroso and the more traditional Poltrona Cumulus chair. Kogan also taps local designers, like Jorge Zalszupin, and materials such as Freijó wood. Fitting, since his projects effortlessly meld into their surroundings.